Our trip home was pretty uneventful, and, as usual, a little bittersweet. Each time we leave on one of our Newell adventures we jokingly say as the trip nears it's end...."why not just keep going for a year? "....of course reality hits, and responsibilities we must maintain for another 11 months, or so, intrude, and we head home. The day when we leave home for good and begin our endless summer is less than 11 months away for Elaine now. After loading the T-Bird, securing the bicycles, and putting away the few things we had put out while in Santa Fe I turned the key around 9:30am to fire up the big Detroit, and, while it turned over strong, would not fire. It got very cold last night...probably into the high 30's, and I should have turned on the block warmer when I got up. So, I turned it on now. Took about 40 minutes for it to get warm enough, and it then fired right up. 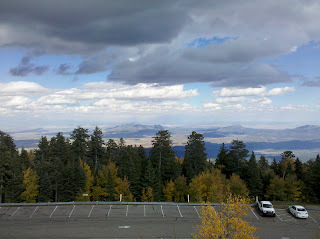 We finally left Santa Fe Skies around 10:20am on October 15th, pointing the Newell south on I-25. The weather was cool, and clear, just as it had been for previous 6 days. 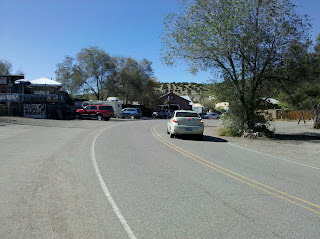 Our tentative goal for the day was Holbrook, AZ. We had driven by Holbrook many times over the years, but never even got off the freeway. As we neared Albuquerque the signs for I-40 westbound began to appear. We transitioned smoothly from I-25 to I-40 and then began a 60 mile climb to 7,300' elevation, before descending back down to Gallup, NM. We stopped to top off our fuel just over the Arizona line at an Indian owned truck stop called Speedy's that seems to have the best diesel price between Albuquerque, NM and Kingman, AZ....we paid $2.91 (cash price) on our way east, and $2.94 on our way west. From there it was a quick 72 miles to Holbrook. We arrived in Holbrook around 3:30pm, parking in a local supermarket parking lot for about 30 minutes while we decided whether to push on to Flagstaff, or call it a day......"call it a day" won out, and we quickly checked into the OK RV Park located about 2 blocks behind the supermarket. This is another nice overnight park...good strong WiFi, level pull through pads, which were about 100' long....more than enough for our 60' length! The staff was courteous, fast, and efficient. We had one filet mignon left so I pulled out the BBQ (Sea-B-Que, a marine grade BBQ made by Dickinson Marine.....http://www.dickinsonmarine.com/bbq.html) and cooked it to a beautiful medium rare condition.....combined with a nice salad, and some Pinot Noir.....mmmmm! Our goal for Saturday was Kingman, AZ, only 238 miles west of us. Our "plan" was to get there late afternoon, and park either at the local Walmart, or Cracker Barrel until about 3am, and then push home to Ontario in the cool of the early morning. We arrived in Kingman around 3pm, and found an empty parking lot a block away from the Walmart in a Medical Plaza, which was not open on Saturday. Much more privacy than Walmart, or Cracker Barrel. Shortly after leveling, setting up the Satellite to watch a few college football games, it began to rain with lightning and thunder for about 2 hours. I'm glad we were stationary for that display! I took an hour nap, finished reading a book, while glancing up once and a while to see some of the game. Around 7pm I suggested to Elaine that I was wide awake, so why not press on now for home, and stop when I got tired. She agreed, and we broke camp. We basically descended on I-40 all the way to the Colorado River where we began a long, long, long climb that seemed to go on for an hour. Finally, around 10pm, as we approached the Kelbaker Road exit (one of the gateways to the Mojave National Preserve), I decided I was tired, and needed a nap, so we pulled off, crossed Kelbaker to the on-ramp, and parked on the shoulder of the onramp. I laid down for what I thought was a 30 minute nap, waking up over 3 hours later at 1:15am. As we merged back on to I-40 I realized our adventure would be over in around 3 hours....we arrived home to Applewood Drive around 4:20pm, parked, and hit the sack. What an amazing 9 days! 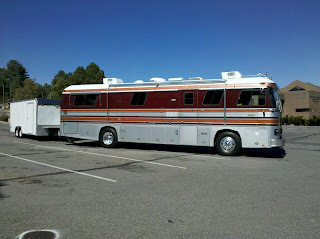 Looking forward to retirement, and being on the road for a couple of years. We never get tired of living in our Newell. It is so comfortable, and easy to live in! Thanks for reading....tune in again for our next adventure over Thanksgiving. Don't know where we are going, but go we will! We have wanted to visit Taos for years, and now we are only 80 miles south of Taos, so we decided to drive up there on our last day in the Santa Fe area. 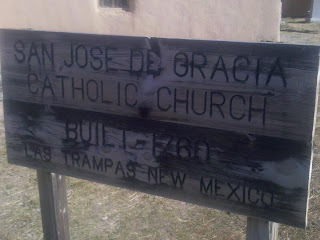 Our intent was to spend 5, or 6 hours walking around Taos taking in all the sites and sounds. 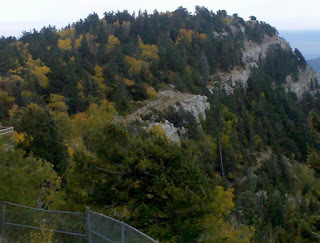 As it turned out our "plan" was pre-empted by the scenic drive to and from Taos. Normally it would take a little over an our to drive directly to Taos, but we decided to take the scenic routes to and from. 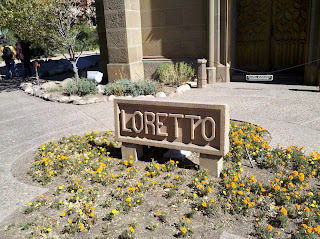 The scenery, and historical sites along the way were so interesting it took us over 3 hours to get there. 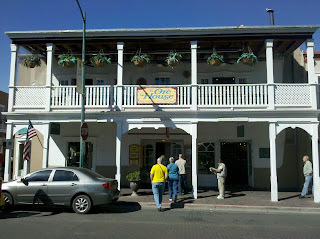 By the time we walked around the "plaza" area, taken the tour of the Kit Carson home, and eaten lunch it was after 3:30pm. If we wanted to get home before dark we needed to be moving along. 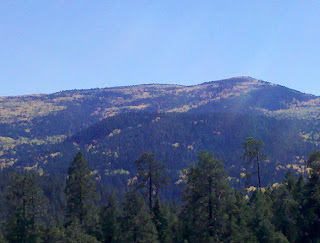 On our return trip we decided to do the "Angel Fire" scenic drive, and it was well worth it. We arrived home around 6:45pm just as it was getting dark. 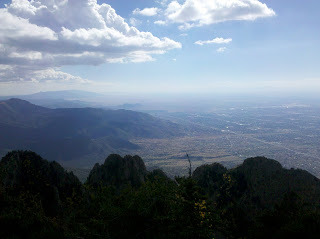 Our drive up to Taos took us north from Santa Fe on US285 to NM68, and then NM75 up to Taos. 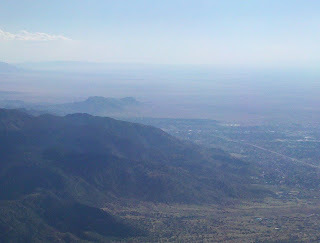 Our drive back took us east from Taos on NM64 to 434 where we drove south NM 518, and the town of Mora. 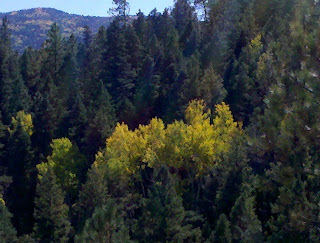 Mora has special meaning to me because I have read a lot of Louis L'Amour's westerns and many of them revolve around Mora where a couple of his fictional Sackett families settled in the 1800's. Here are some of the pictures of our day. It won't be hard for anyone reading this blog to understand that we were dead tired Saturday night when we arrived in Gallup, NM. Elaine whipped up a quick dinner consisting of Pea Soup and some buttered bread. That was chased with a Rogue Brewery Moca Chocolate beer......mmmmmm! We went to bed around 9pm, and did not wake up until 8am the next morning....I don't remember the last time I slept 11 hours straight. We didn't leave USA RV Park until around 10am, but we only had 190 miles to go to Santa Fe, so we took our time driving stopping several times for 30 minute breaks along the way finally arriving at our home for the next 6 days......Santa Fe Skies RV Park located at 14 Browncastle Ranch Rd. 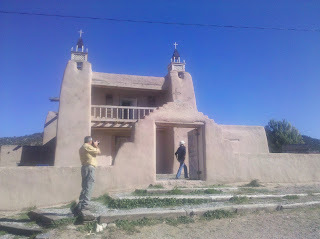 just south of Santa Fe. Following are pictures of our view. Forest and Cindy, whom we met in Creede, CO last summer, arrived in their Newell about 30 minutes before we did. 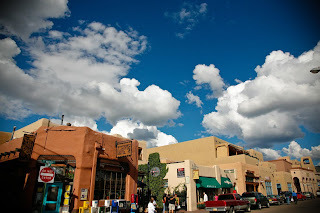 Once we were settled in and unloaded the T-Bird we decided to head into Santa Fe for a late lunch, as well as do some food shopping. We located a little Mexican restaurant called Posas located next door to the local Albertson's supermarket. This was/is real Mexican cuisine......Forest ordered a green sauce enchilada that he says was the hotest thing he had ever eaten, and he is Cajun! 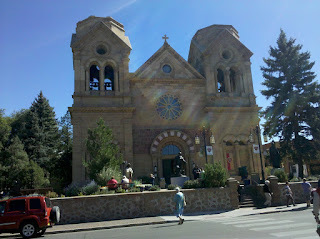 The next morning, Monday, we headed again into Santa Fe for a day of site seeing. We were able to find a public parking lot rather easily. 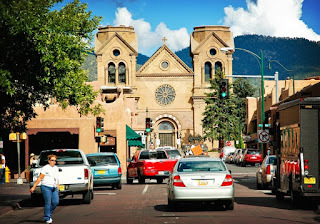 We started our walking tour of Old Town Santa Fe by walking directly to the Plaza where we came upon many vendors, mostly Native American, selling their wares. Elaine bought a copper guitar pic for our son, Tim, a Santa Fe chili pepper refrigerator magnet for home, and a really cool necklace for Elaine. 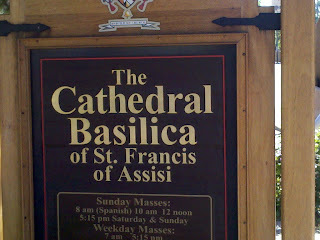 After that we headed down Palace toward the Basilica of St. Francis of Assisi. 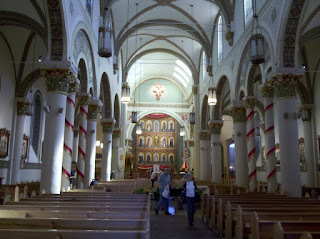 What a beautiful cathedral! 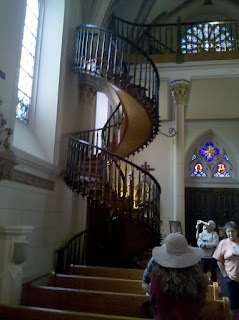 From there we walked over to the Loretto Chapel, and then to lunch at the Iluminaria Restaurant. The Old Town area is very charming and easy to walk from one end to another. I would love to spend a few days exploring all the shops and restaurants, but that will be for another day! Later that evening another couple we go to know better at the Creede rally drove down from Denver to spend a little time with us.....David and Denise. They came over around 8pm for some snacks, drinks and a great fire. We sat around laughing until after 10pm....I hope we didn't disturb anyone with our laughter....haha! 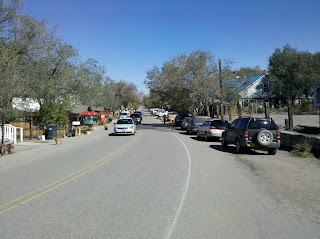 Tuesday morning we decided we would drive down to Madrid, NM located on NM 14, otherwise know at the Turquoise Highway. Madrid is a quaint little art community. The local artists display their art in every conceivable medium. I was very impressed with a lot of the art. 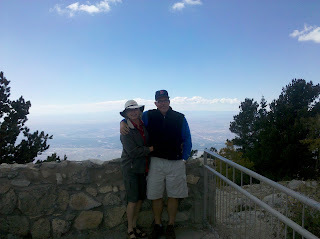 From there we headed further south to drive up to Sandia Crest located at about 10,400' elevation where we got an amazing view of Albuquerque. 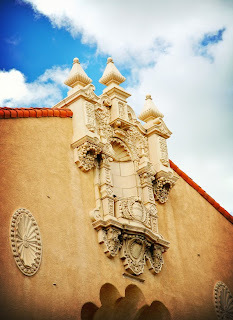 We got back to camp around 4pm and made plans to join David and Denise in Santa Fe at "The Shed", an amazing Mexican restaurant located on Palace just a half block from the Plaza, and the Palace of Governors. We said our goodbyes after dinner to David and Denise who had to return to Denver the very next morning for pressing business. Wednesday morning we decided we were not going to do anything except putter around camp, and then, maybe, take a bike ride that afternoon. Forest and Cindy took off to see a historical point of interest north of Santa Fe. Ultimately we took a bike ride on the tandem for about 20 miles. The weather on Wednesday, like every single other day was marvelous.....high 60's, low 70's. Forest and Cindy got home around 6pm, and invited us over to their coach for some Gumbo....some of the best I have ever had! Our intent had been to start our adventure around 7pm on Friday the 8th, but like most best laid plans we left a little after 9pm. Our "plan" was to drive to Kingman, AZ and spend the night behind the Cracker Barrel, and then hit the road early the next morning. I figured we would be in Kingman by 2:30am.......but.......we were about an hour out from Kingman in the tiny border town of Needles taking a short break...you know, get out walk around the coach, making sure nothing is going wrong that we're not aware of yet. We get back in, I turn the key, and nothing. I check to be sure it is in neutral.....DP's have no "Park". You have to start it in neutral. Yep, it's in neutral, but it won't even turn over...I can hear the solenoid on the rear panel clicking. The batteries are all topped off, and all the lights are working so my old problem in the rear panel has not returned (loose connection). Finally, I give up and call Good Sam Club ERS. They initially want to tow me somewhere, but I ask "where" at 2am??? I ask them to locate a 24 hour service who can send someone out to troubleshoot my problem. Don from Advanced Mobile Tire, Inc. arrived at my location around 3:20am.......he quickly determined that the starter was getting a weak signal....only about 3 volts.....not nearly enough to turn the big Detroit Diesel over, so we removed the existing trigger wire and ran a new one down to the starter, and what do you know...it started right up. He had us back on the road by 4am, and we arrived in Kingman around 5am......I ended up sleeping around 2 1/2 hours.....not what I had "planned".....haha! We got up and got dressed around 7:30am and went into the Cracker Barrel for a great breakfast and lots of coffee. We were on the road by 8:30 headed east into the sun. 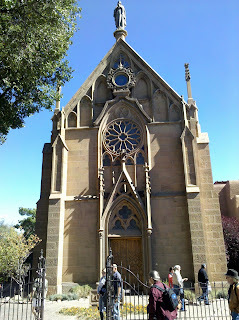 Our destination for Saturday was Gallup, NM. We took a 30 minute break in Flagstaff, and then pushed on down I-40....the weather was great....crystal clear skies and a slight tail wind. By the way, this is the first trip we have pulled our new car hauler trailer with the T-Bird in it and it has pulled great so far! Our distance on Saturday was 327 miles.....I really don't like driving too much more than 300 miles a day, so this was within my comfort zone. I was planning....there's that "p" word again...to fuel up in Albuquerque, but I hadn't accounted for the extra weight of the trailer and car. We were about 30 miles out from Gallup and I had to give in and get fuel as it appeared we were down to less than a 1/16th of a tank...maybe 11 gallons.....not a good idea to temp the gas gods so about the time I was getting concerned we saw a sign for "Speedy's", and a price of $2.91 per gallon....almost 40 cents lower than Ontario, so we exited and I took $500 into the cashier for pump #29 expecting to leave most of that with her after filling.....my tank takes 180 gallons and I expected, based on where the needle was, to put in close to 170. Well, to my pleasant surprise the pump clicked off at 143 gallons! Looks like the gauge is a little off as I must have had close to 37 gallons left....hmmmm....I could have made it to Albuquerque. 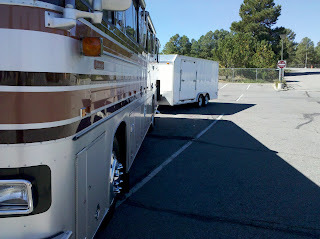 We finished fueling up and got back on I-40 for the final 19 miles into Gallup, NM and USA RV Park. 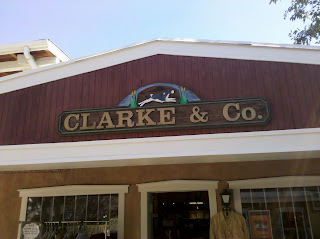 This is a great park, and is a totally family run operation. They really provide great customer service, and do everything in their power to make sure your stay meets your expectations. In addition to all that the WiFi signal was amazing on the back row where we parked for the night....very fast considering how full the park was. 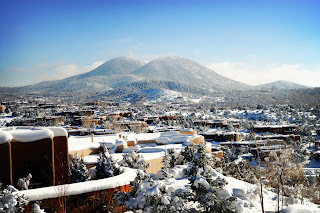 Today is Wednesday, and in two days we depart on our next Newell adventure to Santa Fe, New Mexico. There is a lot of history in that area, and I've wanted to visit there for years, so, needless to say, we are very excited to, at last, be embarking on a trip to that destination. We'll leave about 8pm tomorrow evening......avoiding the heat of the day to get over Cajon Pass, and into the Mojave Desert. Our first destination will be Kingman, AZ where we plan to overnight at the Cracker Barrel Restaurant, then on to Gallup, NM on Saturday, and finally arriving in Santa Fe on Sunday around noon......it is about 812 miles one way and I-40 will take us through some spectacular country to Albuquerque where we will pick up I-25 north to Santa Fe, NM.